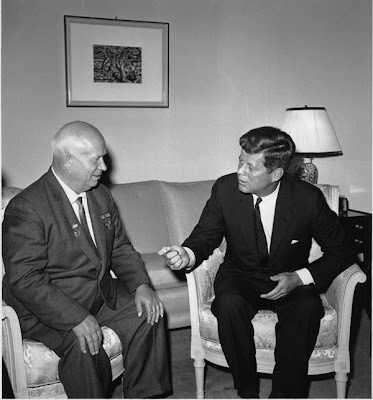 Vienna, 1961: the only face-to-face meeting of Premier Khrushchev and President Kennedy. In the 1950s and early 1960s, the so-called National Security State (NSS)--minus the President--was itching for a war with the Soviet Union. This war, they all concluded, the U.S. was sure to "win," owing to its huge lead over the USSR in nuclear weapons. The NSS here included the National Security Council, the Joint Chiefs of Staff (i.e., Pentagon bigwigs), and the CIA and other intelligence agencies. They were confident they could prod, trap, or trick the young and inexperienced President Kennedy into authorizing this war. And they came very close to trapping him during the Cuban Missile Crisis of 1962. 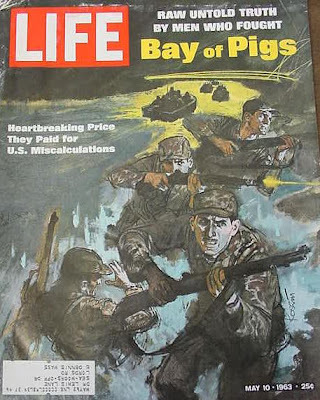 The CIA-sponsored Bay of Pigs invasion of Cuba in April 1961 had been an earlier attempt to touch off a war with the Soviet Union. Kennedy did not fall for the ruse. 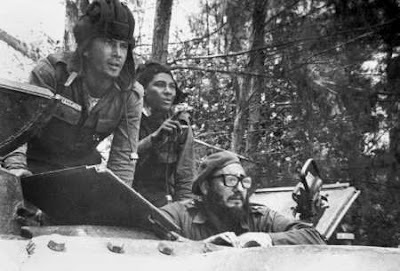 He chose humiliation over Armageddon and refused to back up the anti-Castro rebels with ground troops or air cover. 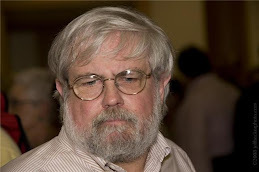 Afterwards he fired CIA director Allen Dulles and declared his intention to smash the CIA into a thousand pieces. Life had to borrow a cover artist from Stag magazine. 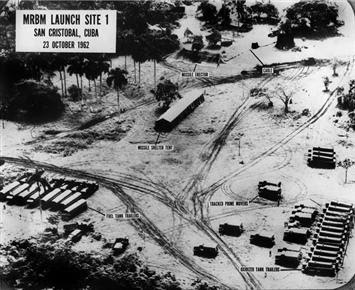 In mid-October 1962, U.S. spy planes revealed the existence of at least one Soviet missile base in Cuba. The missiles were capable of delivering nuclear warheads to the United States. To fray tempers still further, a U.S. spy plane was shot down over Cuban territory, and Kennedy ordered a naval blockade of Cuba. The NSS campaigned hard for the go-ahead to bomb Cuba . . . before the missiles could be armed with nuclear warheads. This action would have the added benefit, they "reasoned," of touching off the long-sought war with the USSR. Years later, the U.S. discovered that the Cuban missiles already were armed with nuclear warheads. We now also know that at the same time nuclear-armed Russian submarines were submerged off the coast of Cuba. Oops-y! Memo: Next time, get better intelligence before starting war. escalate into war with the Soviet Union--which the U.S. would surely "win." So in 1962, the world came closer to nuclear war than even Kennedy realized. Credit for preventing the holocaust goes to Kennedy and--to an even greater extent--to Soviet Premier Nikita Khrushchev, who held back the Russian dogs of war. He did so--at great cost to his career--in part as a personal favor to Kennedy, with whom he had developed a secret, personal written correspondence. on the southwest coast of Cuba. Karl Hubenthal, published October 29, 1962.
had a better reading of the lessons of the missile crisis. Kennedy was persuaded (by SANE chairman Norman Cousins) that he needed to repay Khrushchev’s favor by announcing a bold next step towards peace. 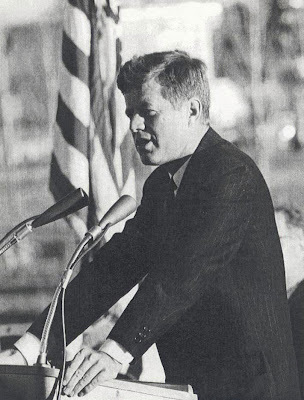 He did so at American University, June 10, 1963. Here he denounced the military-industrial complex, and he announced that negotiations leading towards abolishing nuclear weapons would soon begin. As two practical steps in that direction, he declared a unilateral halt to atmospheric testing of nuclear “devices,” and he announced that high-level negotiations towards banning nuclear testing would begin immediately--in, of all places, Moscow! It's thrilling to hear the loud applause from the audience that greeted the announcement of each of these "steps." Unlike the totally scripted Presidential speeches of today, "applause lines" with appropriate pauses were not written into the text back then. Consequently, there was much less applauding. But what there was of it was genuine. Further proof of my theory that, whereas the American state wants war and more war, the American people want peace and prefer to resolve international differences by negotiation and--remember this old word?--statesmanship. A few months after this surprising speech, the world’s first Nuclear Test Ban Treaty had been negotiated, signed, and ratified by Congress. A few months after that, on November 22, the assassination of Kennedy was completed on the third attempt within three weeks. Eleven months later, Premier Nikita Khrushchev also was removed from office, though allowed to live. He died of natural causes in 1971. Score: U.S. and Soviet National Security States, 2; “Unreliable” peacenik heads of domestic government, 0. Trivia Question: On the day following the American University speech, Kennedy addressed the nation in another major speech. What was the topic? Answer: Civil Rights. Disarmament crusader John F. Kennedy came to realize that there could not be peace without justice--specifically, Civil Rights. At around the same time, Civil Rights crusader Martin Luther King came to realize that there could not be racial justice or Civil Rights without disarmament. "Everything That Rises Must Converge," reads the title of a short story (by Flannery O'Connor) of the same period. Kennedy's conversion to an advocate of peace and disarmament came gradually, then took a large leap in October 1962. 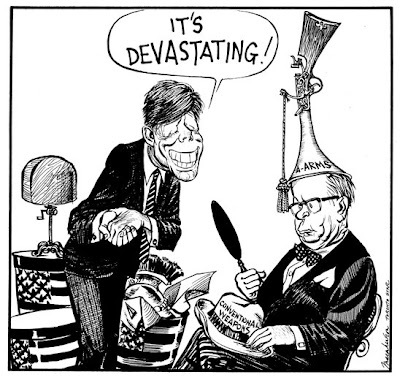 Early in his term--as this Canadian cartoon indicates--Kennedy tried to convince Canada to acquire nuclear weapons. He succeeded. The seated figure is Prime Minister Lester Pearson. 1963, the "peace" speech because JFK uses the word multiple times. It is the most daring, most courageous, most far-sighted speech devlivered by a 20th century president. I was so inspired by it and, at the same time, so overcome with melancholy at the world that might have been, that I used excerpts from the speech in my book "Murder Of An American Nazi" (pp. 101-103). Ironically, JFK was miffed at the lack of national reaction to it; of course, in the summer of 1963 American slept blissfully unaware under the blanket of security he provided. Jfk was not the greatest peace nik around. He continued raids on to cuba till oswald killed him . He and rfk approveed every assasnation attempt on Castro. Also Diem was overthrown at his wishes because he was becoming an independent dictator.this was 3 weeks before jfk murder. So ifeel if he had lived he would of supported the following junta in south vietnam like lbj did with more "advisors" and aid. You're right, Patricia, Kennedy remains an ambiguous figure. Thanks for your comment. Still, a good portion of the National Security State DID think JFK inadequately hawkish on Vietnam, on the USSR, & on Cuba. LBJ gave them more of what they were asking for. Thanks for reminding us that Kennedy wasn't much of a pacifist.